*New 2015 Corolla LE $179/mo lease for 36 months. $0 down. Subject to credit approval. Not all customers will qualify. Offer based on MSRP of $19,615 including delivery, processing and handling. Offer excludes tax, tag, and dealer fees. You pay $0.15 per mile over 12,000 per year. *New 2015 Prius Two $249/mo lease for 36 months. $0 down. Subject to credit approval. Not all customers will qualify. Offer based on MSRP of $25,250 including delivery, processing and handling. Offer excludes tax, tag, and dealer fees. You pay $0.15 per mile over 12,000 per year. 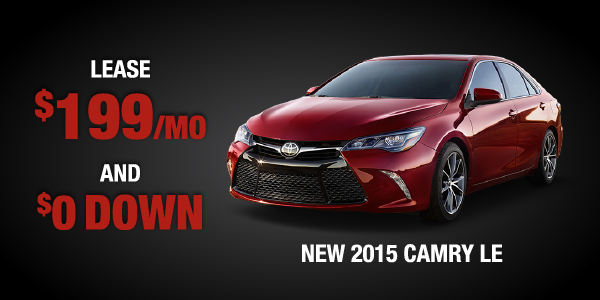 *New 2015 Camry LE $199/mo lease for 36 months. $0 down. Subject to credit approval. Not all customers will qualify. Offer based on MSRP of $24,020 including delivery, processing and handling. Offer excludes tax, tag, and dealer fees. You pay $0.15 per mile over 12,000 per year. *New 2015 RAV4 LE $239/mo lease for 36 months. $0 down. Subject to credit approval. Not all customers will qualify. Offer based on MSRP of $24,790 including delivery, processing and handling. Offer excludes tax, tag, and dealer fees. You pay $0.15 per mile over 12,000 per year. *New 2015 Sienna LE $289/mo lease for 36 months. $0 down. Subject to credit approval. Not all customers will qualify. Offer based on MSRP of $32,545 including delivery, processing and handling. Offer excludes tax, tag, and dealer fees. You pay $0.15 per mile over 12,000 per year. *One gift card per family. Gift Card offer ends July 31st 2015.